Calculus is hard?no doubt about it?and students often need help understanding or retaining the key concepts covered in class. 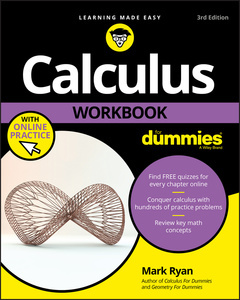 Calculus Workbook For Dummies serves up the concept review and practice problems with an easy?to?follow, practical approach. Plus, you?ll get free access to a quiz for every chapter online. With a wide variety of problems on everything covered in calculus class, you?ll find multiple examples of limits, vectors, continuity, differentiation, integration, curve?sketching, conic sections, natural logarithms, and infinite series. Plus, you?ll get hundreds of practice opportunities with detailed solutions that will help you master the math that is critical for scoring your highest in calculus. The primary audience is high school and college students who are taking a course in calculus or in a related discipline. This book will also be a valuable resource for individuals who want a refresher on calculus for a related course or for practice for a standardized test that includes a section on calculus. Furthermore, this book is attractive to teachers as a classroom supplement, or to tutors for supplemental explanation. Mark Ryan has taught pre–algebra through calculus for more than 25 years. In 1997, he founded The Math Center in Winnetka, Illinois, where he teaches junior high and high school mathematics courses as well as standardized test prep classes. He also does extensive one–on–one tutoring. He is a member of the Authors Guild and the National Council of Teachers of Mathematics.